Pamper the palate with a rustic yet elegant cuisine presented in heavy African cooking pots cooked over a gentle flame. 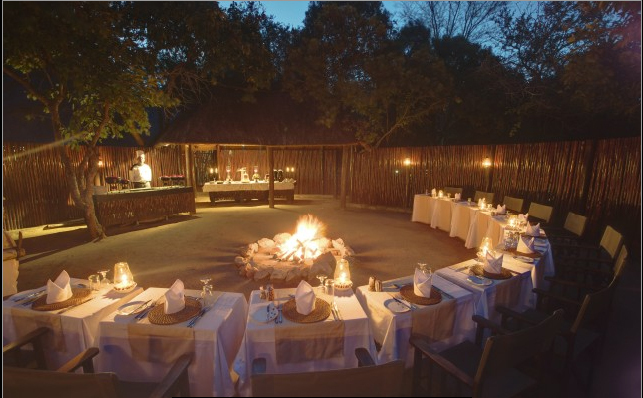 Guests dine around an open fire in a circular indoor boma with choices selected and cooked by expert chefs. Kapama Buffalo Camp entices the wild call of Africa around roaring fires and traditional cooking techniques for an authentic dining experience. Kapama Buffalo Camp is 100.4km from the centre of Hoedspruit , the nearest airport 95.3km (Polokwane Airport).